Stiff, dark green leaves edged orange-red, are topped with bright brick-red summer flowers that gently fade to yellow in autumn before dying back. This fabulous spurge looks best as part of a vibrant planting scheme based on hot colours in a sunny border, or with bronze-tinted ornamental grasses. Given a moist, well-drained soil, it may need restricting, since it quickly forms small colonies. Categories: Autumn, E-H, Featured Plants, Plants A-Z, Plants by Season, Plants In Situ, Spring, Summer, The Bog Garden and Bank, The Hot Border. Of the many Spurge now available to gardeners, this is one of the easiest and most reliable, particularly in colder climate areas. Plants form a bushy, upright mound of dark green leaves with the appearance of a small shrub. Heads of fiery orange bracts begin to appear in early summer, and continue for many weeks. New growth in early spring is rich bronzy-red in colour. Clumps take a few years to settle in and develop to mature size. 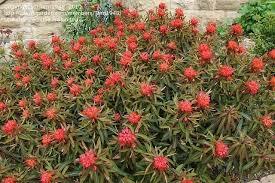 Easily divided in early spring, every 4 to 5 years.